Overweight dog- 7 Tips To Get Your Pet Bikini Ready! 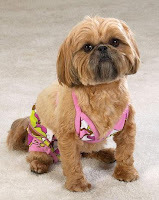 Get Your Pet Bikini-Ready--7 Easy Tips! 1) Feed your pet at regular meal times. It is better to feed 2-3 smaller meals than one big meal. Do not free-feed by leaving food out all the time unless your pet has a health condition that requires it. 2) Schedule exercise every day. If you have a dog, this is a great way for you both to exercise together and make new friends. If you have a cat, this is a way for you to bond even closer--try out new toys such as a laser or feather toy. 3) Watch the treats. Treats add up! You can still give your pet treats but use healthy options such as vegetables (e.g. baby carrots), a sliced apple or some of their daily kibble. For example, you can use some of their dry food kibble for treats but be sure to reduce the amount of kibble served at dinner. For best results, set aside a daily amount of treats in a dish so that all family members can "treat" the pet throughout the day. When the bowl is empty--that is it for the day. Remember: one average dog biscuit could be over 100 calories which is about 1/2 the amount of a small can of dog food! 4) If your pet is always hungry and you are trying to cut back, try mixing in steamed vegetables or canned pumpkin. This will help them feel more satiated and add some extra vitamins, minerals and fiber. 5) Sometimes pets beg or are excessively hungry because they are not getting enough protein in their diet. If you have a young pet, consider a grain-free commercial diet, raw frozen food or cooking some fish and adding to their regular food. Please use caution however as some pet owners have a tendency to overdo the protein and this can be life-threatening especially if the pet has a health condition such as liver or kidney disease or pancreatitis. 6) Measure foods carefully! Use a measuring cup--don't "guesstimate" how much a standard cup is. Many scoopers are actually two cups not one. 7) Shower your pet with love--NOT FOOD! Many times people give their pets extra food as a way to show them they love them and often it is because they may feel badly they don't spend enough time with them. Wake up a little earlier on some days or come home once a week at lunch time from work to spend some exercise or play time with your pet.